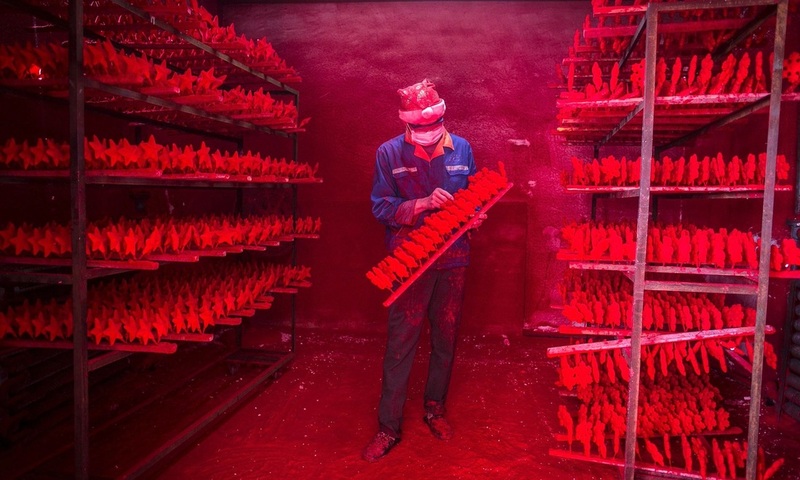 Inside the ‘Christmas village’ of Yiwu, there’s no snow and no elves, just 600 factories that produce 60% of all the decorations in the world. 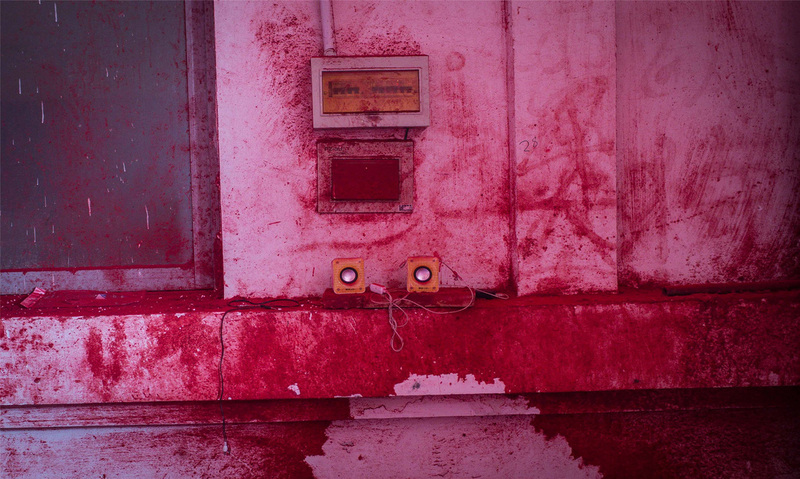 There’s red on the ceiling and red on the floor, red dripping from the window sills and red globules splattered across the walls. It looks like the artist Anish Kapoor has been let loose with his wax cannon again. 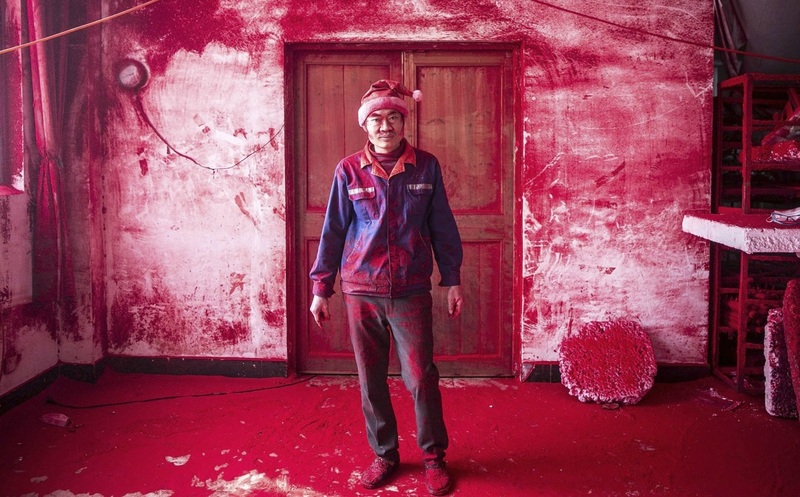 But this, in fact, is what the making of Christmas looks like; this is the very heart of the real Santa’s workshop – thousands of miles from the North Pole, in the Chinese city of Yiwu. Our yuletide myth-making might like to imagine that Christmas is made by rosy-cheeked elves hammering away in a snow-bound log cabin somewhere in the Arctic Circle. But it’s not. 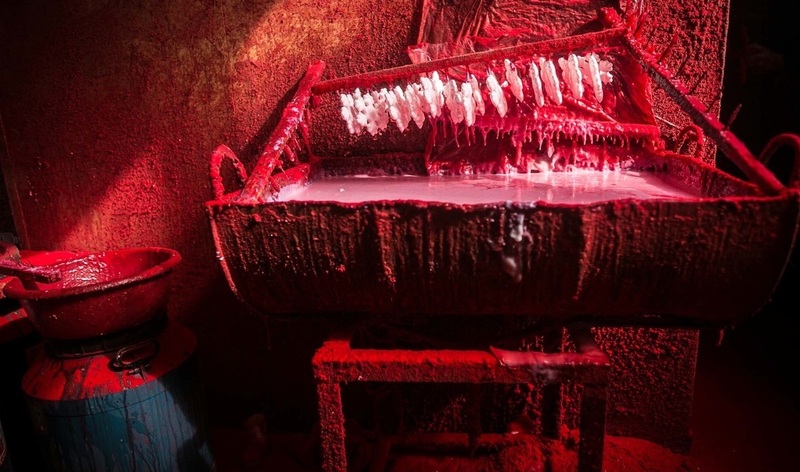 The likelihood is that most of those baubles, tinsel and flashing LED lights you’ve draped liberally around your house came from Yiwu, 300km south of Shanghai – where there’s not a (real) pine tree nor (natural) snowflake in sight. “Maybe it’s like [Chinese] New Year for foreigners,” says 19-year-old Wei, a worker who came to Yiwu from rural Guizhou province this year, speaking to Chinese news agency Sina. 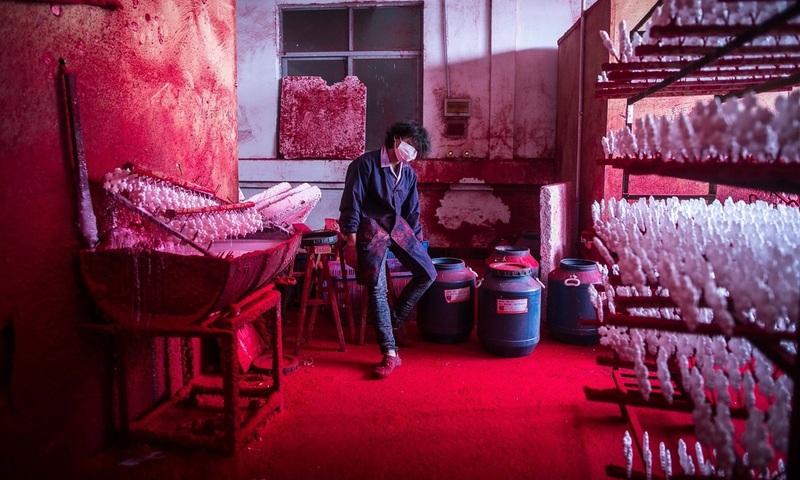 Together with his father, he works long days in the red-splattered lair, taking polystyrene snowflakes, dipping them in a bath of glue, then putting them in a powder-coating machine until they turn red – and making 5,000 of the things every day. In the process, the two of them end up dusted from head to toe in fine crimson powder. His dad wears a Santa hat (not for the festive spirit, he says, but to stop his hair from turning red) and they both get through at least 10 face masks a day, trying not to breathe in the dust. 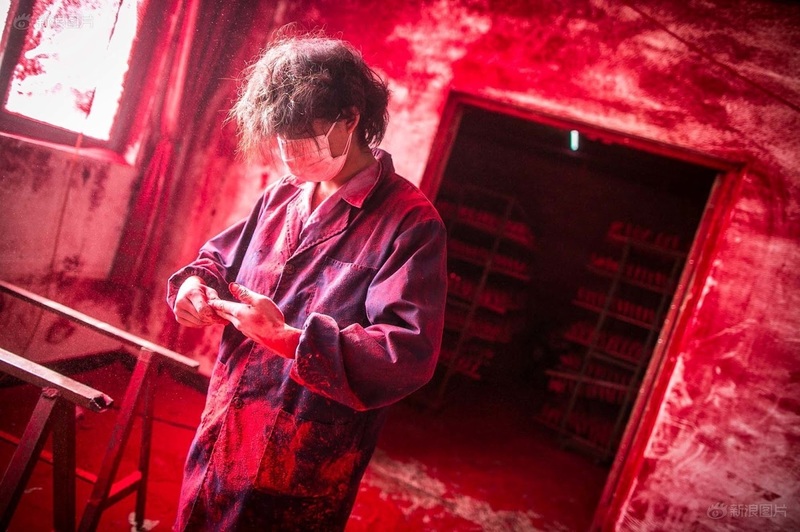 It’s a tiring job and they probably won’t do it again next year: once they’ve earned enough money for Wei to get married, they plan on returning home to Guizhou and hopefully never seeing a vat of red powder again. The complex was declared by the UN to be the “largest small commodity wholesale market in the world” and the scale of the operation necessitates a kind of urban plan, with this festival of commerce organised into five different districts. District Two is where Christmas can be found. There are corridors lined with nothing but tinsel, streets throbbing with competing LED light shows, stockings of every size, plastic Christmas trees in blue and yellow and fluorescent pink, plastic pine cones in gold and silver. 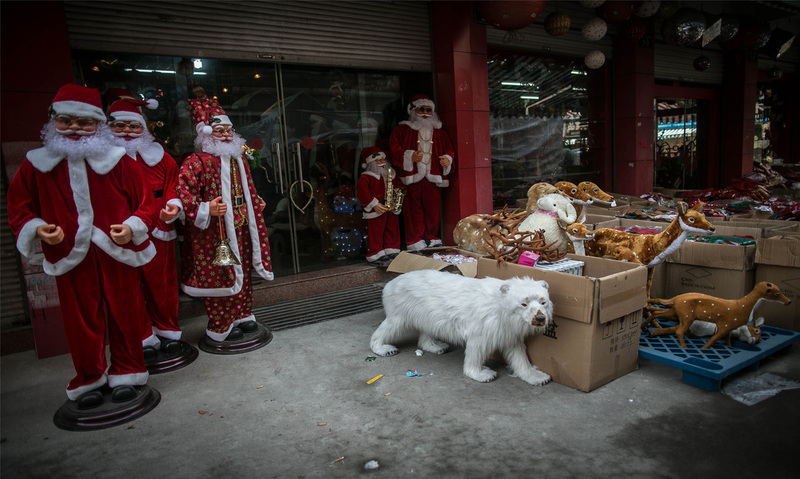 Some of it seems lost in translation: there are sheep in Santa hats and tartan-embroidered reindeer, and of course lots of that inexplicable Chinese staple, Father Christmas playing the saxophone. It might look like a wondrous bounty, but the market’s glory days seem to have passed: it’s now losing out to internet giants like Alibaba and Made In China. On Alibaba alone, you can order 1.4m different Christmas decorations to be delivered to your door at the touch of a button. Yiwu market, by comparison, stocks a mere 400,000 products. Aiming at the lower end of the market, Yiwu’s sales thrived during the recession, as the world shopped for cut-price festive fun, but international sales are down this year. 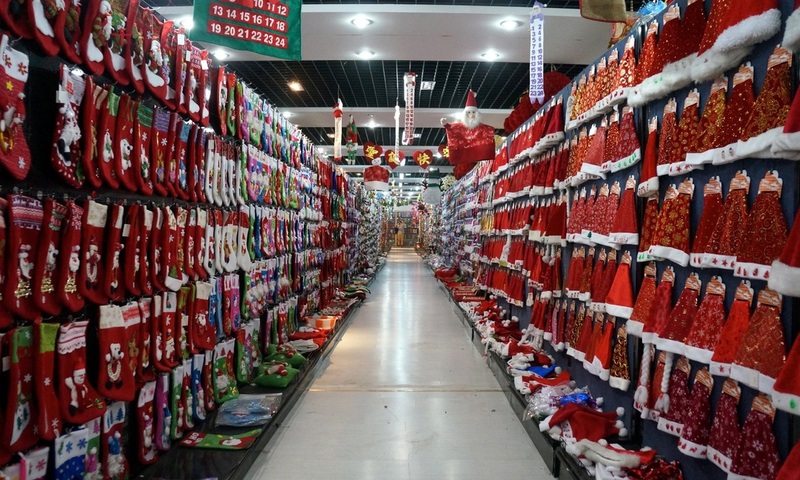 Still, according to Cai Qingliang, vice chairman of the Yiwu Christmas Products Industry Association, domestic appetite is on the rise, as China embraces the annual festival of Mammon. 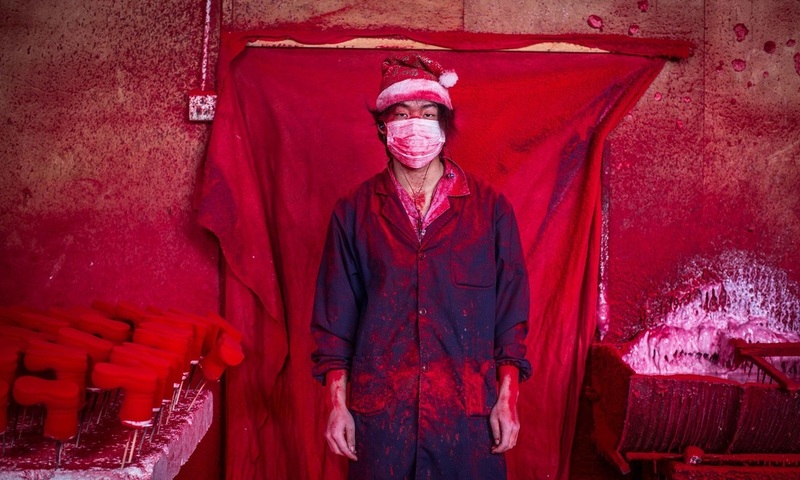 Santa Claus, says the Economist, is now better known to most Chinese people than Jesus. In the recently closed 12th China International Logistic Festival and the 15th China International Transportation and Logistics Expo, Yiwu was rewarded as the 2015 Distinguished China Logistic City Achievement Award, which was another big prize after being conferred as the China Trade Logistic City Award, and China City Logistics Development Special Award in 2014. At the same time, Yiwu Land Port Bureau got the China City Logistics Administration Innovation Award. Distinguished China Logistic City Achievement Award is a comprehensive honor title which reflects a city’s development and achievement on the logistics, and is one of the most influential awards in China logistics. China International Logistics Committee decided the honor owner through a strict discussion, and finally Yiwu stood out and outshone any other competitor. This exemplified at the best that Yiwu had featured special logistics industry edge over others, depending on a right logistics development policy, perfect logistic infrastructure and network. In recent years, Yiwu has posed a high premium on modern logistics’ development. Around the target to build an international land port city, Yiwu has actively pushed forward a joint growth on land, sea, air and rails. 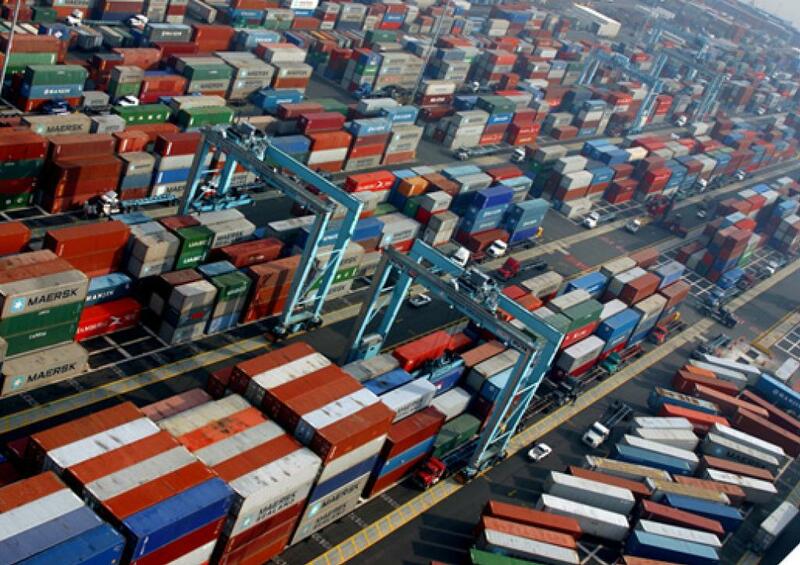 As of now, Yiwu has basically established a complete and connected overall transport and logistics system, and at the same time, air port, bonded logistics center and rail-sea joint have been perfecting. Now, about 5,000 logistics institutes are dealing in different logistics business, and those globally famous logistic giants such as FedEx and Maersk have launched their branch offices in Yiwu, not to mention the fact that Yiwu’s road transport lines have covered more than 1,500 cities.